Having travelled to Cork on Saturday to support our club athlete Aisling Maher as she took part in the Munster Finals of the Special Olympics it was humbling to see the effort and commitment of so many special athletes as they walked, ran, jumped and threw in the various competitions. Able bodied athletes would have struggled in the extremely windy conditions but to see the determination on the faces of all these special athletes as they sped up to the finish line in the face of such a wind would to pardon the pun “blow you away”. Aisling was one such competitor and took part in the Turbo Javelin and 100mts where she recorded 12.55mts and 15.9 secs respectively for these competitions to claim two gold medals, following two terrific performances. 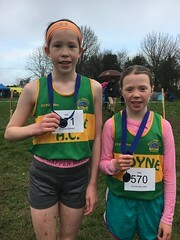 Aisling was representing the Ormond Special Olympics Club of Nenagh/Templemore and over the past number of months has trained so diligently with her coaches in both Moyne and the Ormond Group for this event that she more than deserved every bit of praise heaped on her on Saturday from family, friends and fellow athletes following her success on the track. Indeed special mention must go to all the athletes from the Ormond Group who performed so well with many bringing home gold, silver and bronze medals and special merit badges. Well done Aisling on a fantastic display of running and throwing. Roll on the National Finals.